So you’ve decided that you want to be a sound engineer – and why wouldn’t you? In those social occasions when you’re having one of those Top-Trumps-‘What-do-you-do-for-a -living?’ conversations with people you’ve never met before you’ll trump teachers & nurses and wipe the floor with accountants and traffic wardens in the glamour stakes. All conversation will turn to you and begin with ‘WOW!’ You will probably get to meet more than your fair share of celebrities and never have to wear a tie to work again. This month I’ve written a blog for totaljobs about what it takes to be a sound engineer. This is a field that has expanded greatly over the last few years, with an ever-increasing number of television and radio stations as well as the expansion in the gaming industry and multi-media capabilities of faster internet. Couple that with the falling prices on digital technology making building your own studio ever cheaper, it means there are many more opportunities to make a living out of audio. You want to get into sound engineering? My first piece of advice is… don’t. I say this with a degree of self interest as there are already too many engineers for me to compete against. I say don’t unless you’re serious about it. The market is over-saturated with hugely under qualified people who have computers and the right software, but who don’t know their nyquist frequency from their Doppler effect, and the last thing the audio industry needs is more people de-valuing the skills pool and under-selling the importance of top quality audio production. Get good or get a different career. My second piece of advice is… don’t if you don’t like a high degree of geekiness. Listen to a couple of sound engineers talking to each other and you’ll know exactly what I mean. We can talk for hours about the merits of using one particular microphone over another one for any number of applications. To do this job well you will have to put aside all thoughts of technophobia and be prepared to master every piece of hardware and software you’re presented with. And believe you me, there are an awful lot of them! It is a very technical job and can be very technically demanding. Thirdly… don’t if you don’t like people. 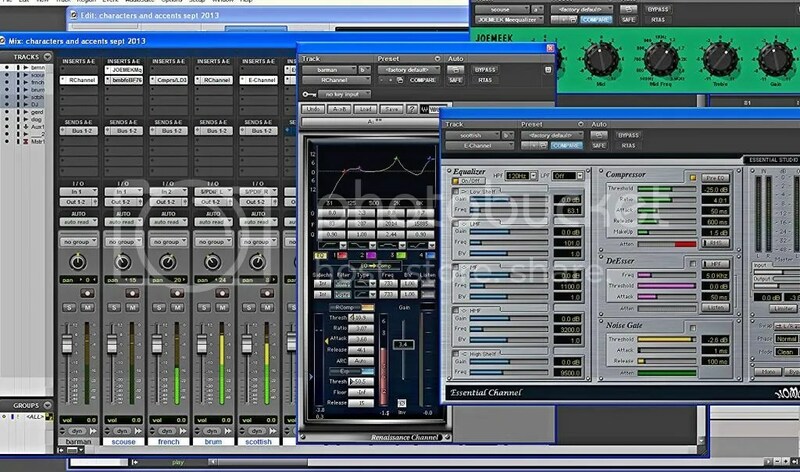 Mastering the technology isn’t enough to be a sound engineer. You will have to work with people and it is an absolute necessity to be able to coax the best performance out of whoever you’re recording. Whether it’s the next-big-pop-star recording their breakthrough single, or a checkout girl saying, ‘Unexpected item in the bagging area,’ reading people and creating the best working environment for them to shine is your responsibility. And again… don’t. If you’ve never before considered becoming a sound engineer then I’d say it’s too late already. I would say that being a sound engineer is a vocation not a job. Sound has to be a passion. Your hearing has to be more than a passive sense. It’s not necessary to play an instrument to be a good sound engineer, but developing ‘musician’s ears’ from an early age is a definite advantage – hearing audio with the level of analysis that a musician can apply is vital. As is a commitment to audio – many people who have carved themselves a career in audio spent their teenage years hanging round recording studios or live venues for no money and sometimes with no actual job or role, just soaking up the atmosphere and watching what happens and why. Many colleges and universities now run music technology courses, and although these are a very good way to learn, prove your commitment and possibly fast track your way into the industry, it’s your portfolio of work that will get you a job rather than a paper qualification. You need to take every opportunity that’s presented to you and soak up knowledge and experience. I don’t believe you can do that unless audio is your calling. Finally… don’t if you’ve been put off by what I’ve written. Sound engineering is no easy option. It’s fiercely competitive and difficult to get into. I’ve taken a deliberately (tongue in cheek) negative approach to writing this article because I think it better serves the mountains you will have to climb to become a successful sound engineer. I have mentored a few teens who have become professional sound engineers and I’ll add one more piece of advice that I’ve given to them. Have a plan B. Work towards your goal of getting a job in sound, but have a plan B in case it doesn’t work out, it doesn’t for the majority of people who try. But if you succeed you will find an industry like no other. You will meet some fantastic people and you will be able to be proud of what you have produced. You can be instrumental in the success or failure of products or advertising campaigns. You can entertain or keep people safe. You’ll find an industry that’s personable and expanding. Get good at what you do and you can be a superhero to your clients. You can’t get any better than that.